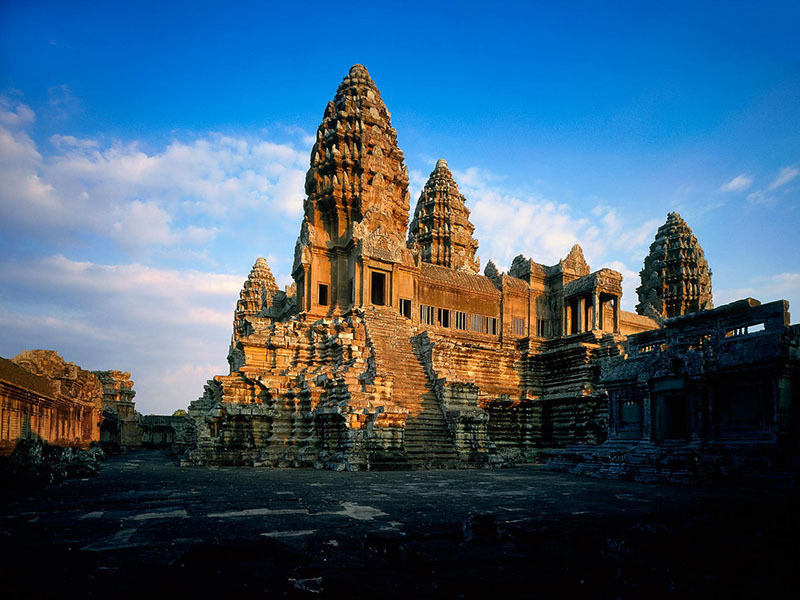 The Angkor Wat Complex is one of the most important archaeological sites in South-East Asia. Stretching over some 400 sq. km, including forested area, Angkor Archaeological Park contains the magnificent remains of the different capitals of the Khmer Empire, from the 9th to the 15th century. They include the famous Temple of Angkor Wat and, at Angkor Thom, the Bayon Temple with its countless sculptural decorations. UNESCO has set up a wide-ranging programme to safeguard this symbolic site and its surroundings. The most famous temple of the Angkor Wat Complex is magnificent Angkor Wat. This architectural masterpiece covers an area of about 210 hectares. 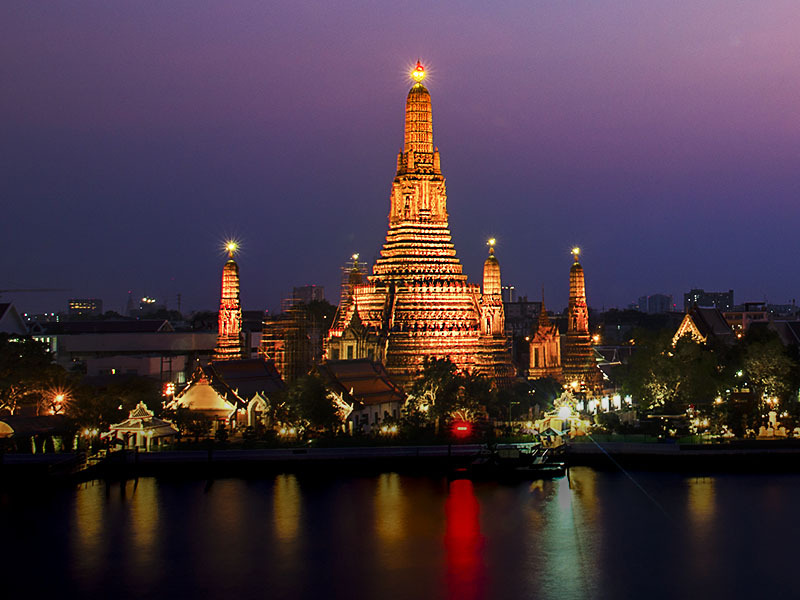 It was constructed in the 12th century by Suryavarman II, and dedicated to the Hindu god Vishnu. The Western approach to the Site is across a surrounding moat and along a raised stone causeway for 250 meters to the main part of the Temple. 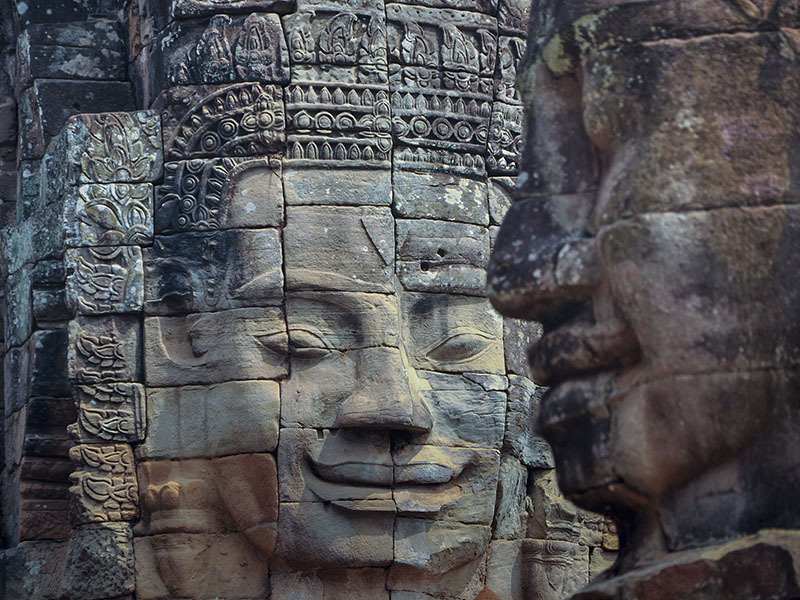 The "Great City" of Angkor Thom was the Angkor era's last capital. It was probably more opulent than most European cities in the late 12th Century, possibly with a population as large as 1 million people. At the center of Angkor Thom is the famous Bayon Temple (late 12th Century - Buddhist) which was built almost 100 years later than Angkor Wat. This imposing stone temple has 54 towers carved with over 200 enigmatic faces. The Bayon's inner and outer galleries are decorated with bas-reliefs recording events of the reign of Jayavarman VII, who was in power at the time the temple was built. Ta Prohm Temple (1186 - Buddhist) is a favorite amongst visitors because it has become part of the jungle, with trees and roots twined around and through the stone monuments. Ta Prohm has been relatively untouched since it was discovered and retains much of its mystery. Its appeal lies in the fact that, unlike the other monuments of Angkor, it was abandoned and swallowed by the jungle, looking very much the ways most of the Angkor temples appeared when European explorers first stumbled upon them. A little more than 20 km north of Angkor, almost at the foot of the Kulen Mountains, sits the remarkable small temple of Banteay Srei. The name, relatively modern means "Citadel of the Women", or perhaps "Citadel of Beauty", and presumably refers to its size and the delicacy of its decoration. Routinely described as the "Jewel of Khmer Art", Banteay Srei is nevertheless a temple of great beauty, with the near-total decoration of its surfaces, is an exceptional example of Khmer Art.